The next meeting of the Astronomical Society will be at Pedro’s Castle starting at 7:00 PM onwards on Friday 15th February. All are welcome and there is no charge for occasional visitors. Ring or email me if the weather looks bad and you are still intending on coming. Meetings are cancelled if there is more than 50 percent cloud cover. The Society has also been invited to a special event at this years’ Cay Fest called “Red Sky at Night” on Saturday 23 February. This is a paid event but there is free entry for anyone who wants to help the Society out. First come first served. We have a good dark spot and will be there from 8 PM till 10 PM, Let’s hope for clear skies!! At The UCCI Observatory the Telescope making course run by Bill Hrudey on Monday Evenings is progressing well – in a month or so there could be seven 6 inch Dobsonian Telescopes ready for action. After much arm twisting (mine) the Introduction to Astronomy course on Tuesday Evening is proving to be a huge hit and was heavily oversubscribed. A follow up course at Easter has been promised. The big news that will be in the press this month is of the close approach of an asteroid called 2012 DA14, at 2 PM EST on Feb 15th. This lump of rock is about 150 ft wide and about 130,000 metric tons in weight. At its closest approach will only be 17,000 miles from the Earth’s surface. If that seems along way “up” to you then consider that geostationary satellites that provide our satellite TV orbit at a height of 22,200 miles – so this takes the record for the closest known approach, for an object this size, though we are told by NASA we are quite safe (!) and that the chances of an object like this hitting the Earth are on average a mere once every 1,200 years. The Star Chart below is taken from Chris Peats excellent website Heaven’s Above –. http://www.heavens-above.com. The site enables the user to produce a chart for the exact latitude of the observer. Many of the charts in Astronomical magazines and books – although of high quality and very readable aim for the latitudes where most of their readers live, certainly not for the Tropics. 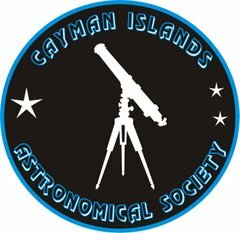 Here in Cayman we are privileged to be able to see many of the Southern Hemisphere stars which cannot be seen at higher latitudes. Overhead along with a 5 day old moon there will also be seen a very bright “star” which is in fact the planet Jupiter. The imaginary line shown on the chart is called the ecliptic and the Sun, Moon and all the planets with the exception of Pluto follow this path. As is now well known Pluto was demoted few years ago to a “dwarf planet”. One of the several reasons for this is simply because it does not orbit the Sun in the same plane as the other planets. When observing the sky at our latitude of 19 degrees North there are occasions when the ecliptic – and hence the planets are almost overhead. In other countries – for example those in Northern Europe the ecliptic can be so low in the sky the planets can only be glimpsed between buildings and trees. The planets Mars and Mercury are hard to find in our evening sky just after sun set- although on February 12th the Moon will not be too far away. Look at the horizon below the Moon and in the darkening sky between you should if lucky just see two star-like objects. The higher of the two will be Mercury.